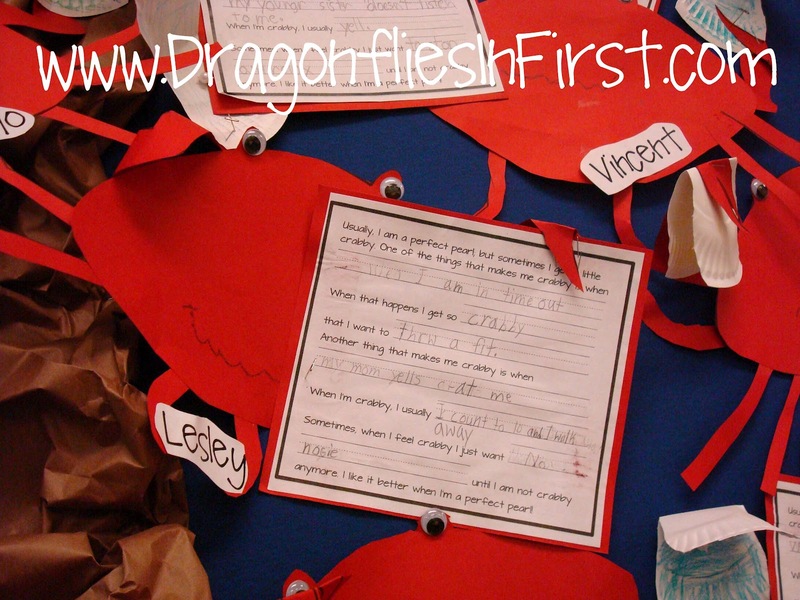 Ocean Writing & Crafts in the Primary Grades • I'm not CRABBY . . . it's FRIDAY! I’m not CRABBY . . . it’s FRIDAY! Home SEASONALEnd of the YearI’m not CRABBY . . . it’s FRIDAY! I did NOT burn myself today. AND I was using a hot glue gun! THAT is saying a lot since now you all know how clutzy I am. 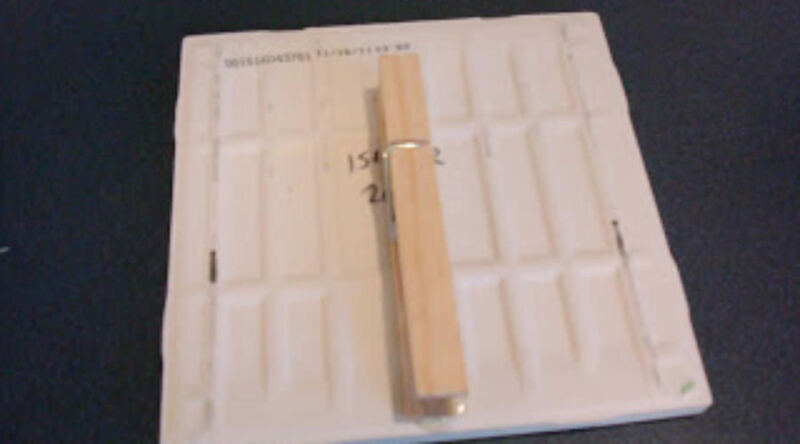 I was glueing clothespins to the backs of white tiles. 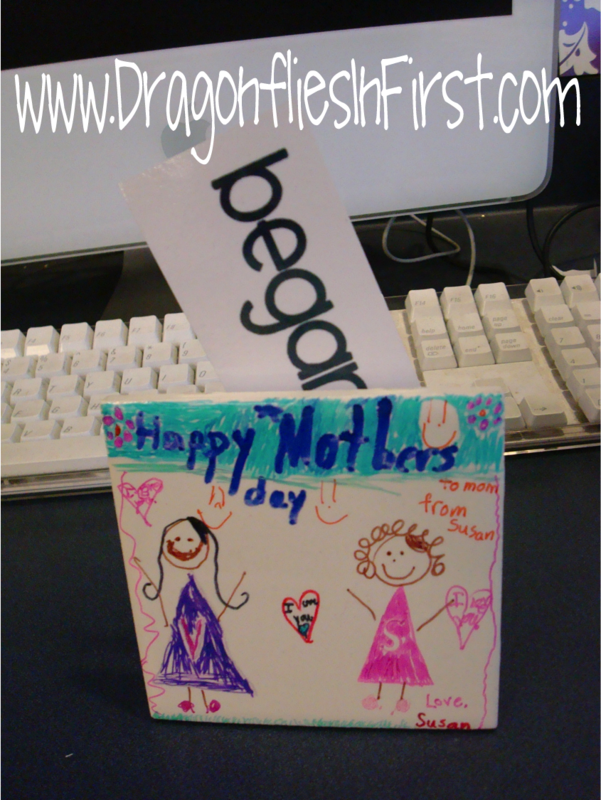 We’ve been making these Mother’s Day projects for a gobzillion years. Then I sprayed clear laquer over them so that the Sharpie doesn’t wash off later if it gets wet or something. Cute and practical. 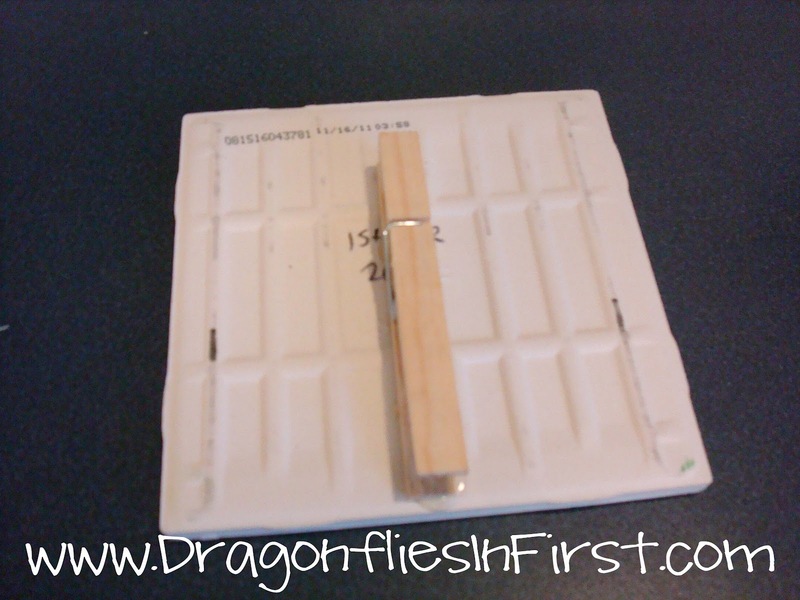 Inexpensive, quick, and easy. Yesterday we read these books. We talked about what it might mean when someone says, “Ah… you are a perfect little pearl.” “And what it means if you are being “crabby“. Then we wrote about things that make us crabby and how that makes us feel. Then we made our oysters & crabs to put up in the tide pool that nearly killed me. It’s WAY too crowded of a bulletin board. With the new, definitely not improved class-size, I’m thinking I will need to shrink the size of the crab next time around. WOOT! It’s Friday Peeps!!! Have a spectacular weekend. Don’t forget I’m doing that random draw thing for the Writing Through the Sea Unit on Saturday. Just leave a comment over on that post if you want a chance to win it. Love your crabs and congratulations on your nomination! I love your blog! Love the crabs! How many students do you have, though? And hooray for your blog's award nomination! No noise!!!! LOVe!!!! I am SO using that with my class when they bug me…just saying! So I really wish I had seen the clothespins on the tiles before today. 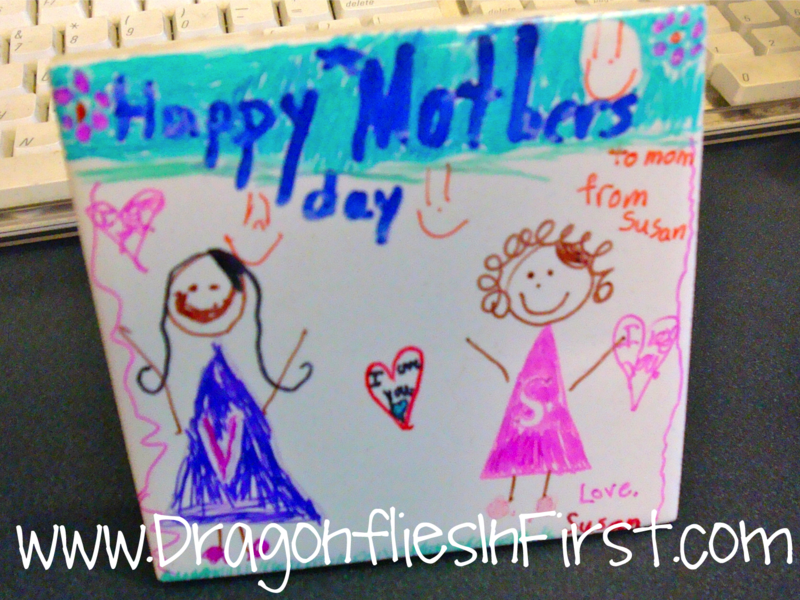 We decorated tiles for our moms for mother's day. It was my first time doing this project. They turned out really cute. Love yours and your bulletin board. Love those crabs and the craft for M'Day! 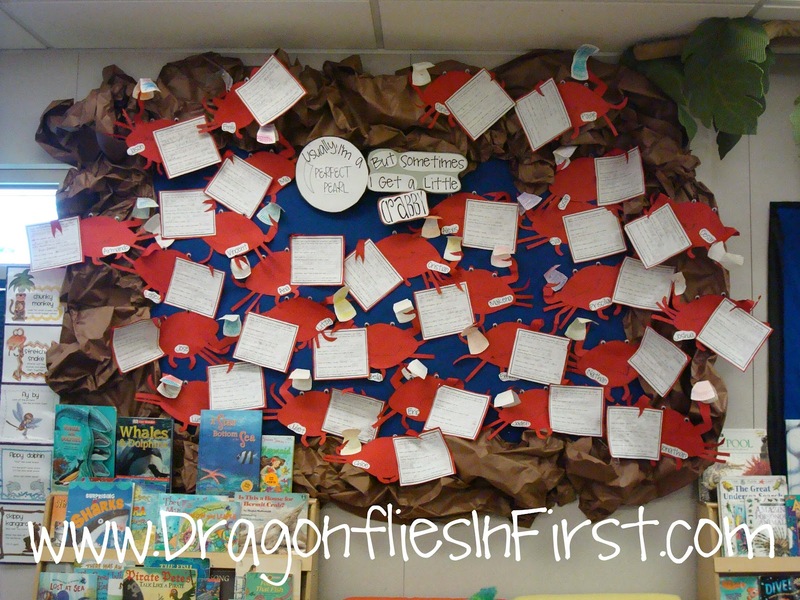 I love the bulletin board and the crab writing! I saw it earlier on Pinterest and had already had it pinned before I read your post! When I sprayed the Shellac the markers ran. Is there a special sealant you used? Please help! Oh no! No there isn't a special brand but you only need to do the slightest mist on them. Definitely not a heavy coating.